Review: Doc McStuffins Time For Your Check Up! 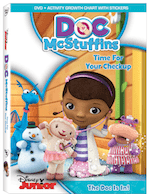 Disclaimer: I received a copy of Doc McStuffins: Time for Your Check Up! on DVD in exchange for this post. All opinions are my own. What’s the one thing you remembered when you were little? Was it playing with a certain toy? Or was it having fun and using your imagination? What do you do with that big box? That’s the number one thing that I loved about Doc McStuffins; it encourages imagination! Doc Mcstuffins is a huge hit in this house! My girls love it! They were very excited to get to watch their new movie. I had a lot of house work today to get prepared for the weekend. So I thought it was a perfect time for me to pop out the DVD. Both my 21 month old and 4 year were glued to the couch the whole time! Not a peep was made from them. I would have to say my daughter’s favorite episode was the Tea Party Tantrum/Blast off!. She just kept asking me, “Mommy can we do a tea party!” My youngest loved Star Blazer Zero! She kept saying blast off over and over again! As I mom I loved the secret meanings behind this DVD! It teaches them about friendships and healthy habits, but in a way that it’s fun for them! I like the Book section. You can watch many of the Disney Junior episodes !! I like that Doc McStuffins is always helping others. I love that we can watch full episodes online! My son really likes this show! I know my grandson would like to watch this great DVD. I love Doc, even when my daughter leaves the room I don’t change it.